A bizarre underwater “icicle of death” has been filmed by a BBC crew. With timelapse cameras, specialists recorded salt water being excluded from the sea ice and sinking. The temperature of this sinking brine, which was well below 0C, caused the water to freeze in an icy sheath around it. Where the so-called “brinicle” met the sea bed, a web of ice formed that froze everything it touched, including sea urchins and starfish. The unusual phenomenon was filmed for the first time by cameramen Hugh Miller and Doug Anderson for the BBC One series Frozen Planet. 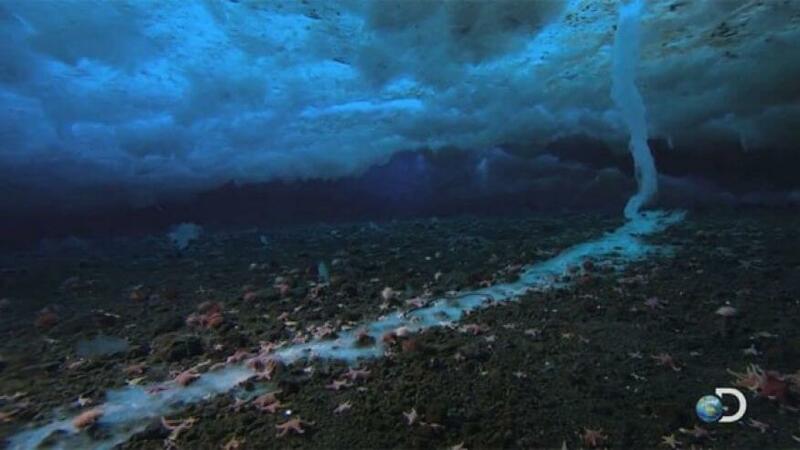 The icy phenomenon is caused by cold, sinking brine, which is more dense than the rest of the sea water. It forms a brinicle as it contacts warmer water below the surface. Mr Miller set up the rig of timelapse equipment to capture the growing brinicle under the ice at Little Razorback Island, near Antarctica’s Ross Archipelago. The location – beneath the ice off the foothills of the volcano Mount Erebus, in water as cold as -2C – was not easy to access. “That particular patch was difficult to get to. It was a long way from the hole and it was quite narrow at times between the sea bed and the ice,” explained Mr Miller. “The first time I did a timelapse at the spot a seal knocked it over,” said Mr Miller. But the team’s efforts were eventually rewarded with the first ever footage of a brinicle forming. Frozen Planet is on at 21:00 GMT on Wednesday, 23 November on BBC One.